Most sources give the marriage date for Richard Cleveland and Ann Neal as 10 SEP 1829. However the Maryland marriage indices found at the New England Historic Genealogical Society and at the LDS website all give 16 SEP 1829 as the date. 1 Connecticut: Vital Records (The Barbour Collection), 1630-1870, Windham, Page 62, Marriage record for Richard Cleveland and Ann Neal at Baltimore, New England Historic Genealogical Society (Online Database). 2 Daughters of the American Revolution Genealogical Research System, Ancestor #A023053. 3 Find A Grave, (accessed 05/07/2013). 4 Maryland, Marriages, 1666-1970, Marriage record for Richard F. Cleveland and Ann Neal, FamilySearch.org (Online Database). 5 New England Historical and Genealogical Register, (New England Historic and Genealogical Society), 1954, Vol. 108, p. 104. 6 Rhode Island: Vital Records, 1636-1850, Page 180875, Marriage record for Richard Cleveland and Ann Neal at Baltimore, New England Historic Genealogical Society (Online Database). 8 Cleveland, Edmund Janes and Horace Gillette Cleveland, The Genealogy of the Cleveland and Cleaveland Families: An Attempt to Track in Both the Male and the Female . . ., Vol. 1, Hartford, Connecticut: The Case, Lockwood and Brainard Company (1899), 504, Internet Archive (Digital Library). 9 Cleveland, Edmund Janes and Horace Gillette Cleveland, The Genealogy of the Cleveland and Cleaveland Families: An Attempt to Track in Both the Male and the Female . . ., Vol. 2, Hartford, Connecticut: The Case, Lockwood and Brainard Company (1899), 1088-1089, Internet Archive (Digital Library). 10 Hitchcock, Mrs. Edward, Sr., The Genealogy of the Hitchcock Family: Who are Descended from Matthias Hitchcock of East Haven, Conn., and . . ., Amherst, Massachusetts: Press of Carpenter and Morehouse (1894), 235, Google Books (Digital Library). 11 Roberts, Gary Boyd, The Royal Descents of 600 Immigrants to the American Colonies or the United States , Baltimore: Genealogical Publishing Co. (2008), 312. 12 Roberts, Gary Boyd, The Royal Descents of 900 Immigrants to the American Colonies, Quebec, or the United States (2 vols.) , Baltimore: Genealogical Publishing Company (2018), 500. 13 Roberts, Gary Boyd and William Addams Reitwiesner, American Ancestors and Cousins of The Princess of Wales, Baltimore: Genealogical Publishing Co., Inc. (1984), 39, Ancestry.com (Online Database). 14 Roberts, Gary Boyd, comp., Ancestors of American Presidents , Boston: New England Historic Genealogical Society (2009), 449, 456-457, 461, 474, 479, 580, 663. 15 Waters, Henry Fitz-Gilbert, Genealogical Gleanings in England, Volume 2, Boston: New England Historic Genealogical Society (1901), 1068. 16 Watkins, Walter K. and Eben Putnam, New England Ancestry of Grover Cleveland, President of the United States, Salem, Massachusetts: The Salem Press (1892), 7, Google Books (Digital Library). 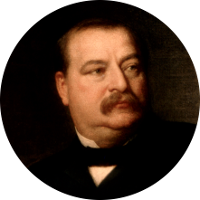 17 Wikipedia, "Grover Cleveland", (accessed 03/04/2013).